This month on The Chat we’re back with an interview with award-winning author Michael Christie, whose book If I Fall, If I Die created well-deserved buzz on both sides of the border when it was released in 2015. If I Fall, If I Die tells the story of Will, a young boy living with his agoraphobic mother in Thunder Bay. As the novel opens, Will ventures forth outside his home for the first time. Through an artistic outsider, Will is introduced to the world of skateboarding and gradually pulled outside the confines of his small world. 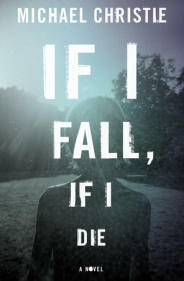 If I Fall, If I Die was longlisted for the Scotiabank Giller Prize and was selected as a New York Times Editors' Choice. 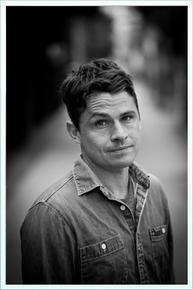 Michael's previous collection of short stories, The Beggar's Garden, was longlisted for the Scotiabank Giller Prize, was a finalist for the Writers' Trust Prize for Fiction, and won the Vancouver Book Award. He holds an MFA from the University of British Columbia, and prior to his MFA, he was a sponsored skateboarder and travelled throughout the world skateboarding and writing for skateboard magazines. Born in Thunder Bay, he now lives on Galiano Island with his wife and two sons. Trevor Corkum: How was If I Fall, If I Die born? Michael Christie: I always knew that I’d write a novel featuring a character at least partially based on my mother. She was agoraphobic for much of her life, and my childhood consisted mostly of hanging out with her, indoors, making things, reading, and listening to music. She was the one who really taught me to be creative. Not by instruction, but by working on her own projects alongside me. It’s something my wife and I try to do with our sons: to render it normal for them to see their parents making things. It goes so much further than saying: “Now is our scheduled creativity time, kids. Here’s your paint. Now paint me a nice house.” Human beings just don’t learn in this fashion. Anyway, my mother died in 2008, and while I’d always imagined I’d write my agoraphobia novel much later in my life, I decided it was a good time, because I was in such a raw, emotional place and because I suppose letting go seemed so impossible to me. I realize now that I needed to spend a few more years with her, or at least a fictional version of her. TC: If I Fall, If I Die is set largely in Thunder Bay, the city you grew up in. It’s a gritty, bleak, and ultimately fascinating and rich setting for the book, full of muddy meandering creeks and ghostly grain elevators. How did you go about building your fictional world? Was it important to you to replicate the specific details and energy of the city as you knew it? Or did you begin with particular details in mind and then fictionalize or alter it as you wrote? MC: More than wanting to capture the details of Thunder Bay with any kind of real-world fidelity, I wanted to render an almost gothic, cartoonish portrayal of the place. In my childhood, Thunder Bay, with its freight trains and lake boats and abandoned grain elevators, seemed so scary, cruel, grimy, ruined, and beautiful, so far away from the bright shiny places I’d only glimpsed on television and in movies. This kind of reverent fascination is universal, I think. Everyone’s childhood environment seems far more grand and scary and foreboding and wonderful than it really is, so I guess I wanted to write from that perspective, with the kind of wide-eyed mystification of a child. Recently my son has taken to using the word ‘epic,’ and I love it, because it says so much about the way children view the world. And, isn’t this the aim of writing? To remind us of the overwhelming ‘epicness’ of everything? I mean drinking a tall glass of water on a hot August day is an unbelievably epic experience, if you really consider it. I mean drinking a tall glass of water on a hot August day is an unbelievably epic experience, if you really consider it. TC: One of the things I loved about the book is how accurately you capture the energy, adventure, longing and emotional architecture of boyhood. Will is a complex, compelling, and vulnerable hero. Can you talk about how Will developed as you wrote the book? Did he visit you fully formed, or did he reveal his personality to you incrementally as you worked? MC: Of course there is much of myself in Will. Like him, I came from such an unusual home situation, and moving out into the world was really trying for me. I was a pretty strange kid, and retreated into books (and skateboarding) as a way of mitigating this alienation. And yet Will is also very much not me. He’s based on my son and other kids I knew growing up. And much of him is simply invented. But I’ve always longed to see rendered in fiction that strange mix of bravado, narcissism, insecurity, insanity, common sense, and naivety that makes up every child’s mind (not just boys). This book is, at least in part, a bildungsroman, and I guess I wanted to attempt to contribute something new to that particular sub-genre. Oh, and my characters always reveal themselves to me incrementally, as you said. I’m writing them to find out who they are, not to tell the reader who they are. My characters always reveal themselves to me incrementally, as you said. I’m writing them to find out who they are, not to tell the reader who they are. TC: One of the central tensions of the book is Will’s relationship with his mother, a highly creative, intelligent woman who also lives with extreme agoraphobia, a condition which has kept both Will and his mother inside for most of his young life. Can you talk more about your own familiarity with agoraphobia, and what you learned about the condition as you wrote? MC: As I mentioned, my mother was agoraphobic, so I had some real firsthand experience with the condition, not all of it particularly enjoyable. I remember puzzling for hours about why my mom couldn’t do the things other parents could, like go on vacations or even go to the grocery store. When you’re the child of someone with a serious mental illness or addiction, you become almost a kind of emotional detective, because you’re constantly worried that this person (who is supposed to be caring for you) could potentially fall apart and be lost to you forever. So there’s this precariousness to everything. It’s terrifying. You watch for signs. You fight to understand. Which is what I did. Years later, I ended up working at a homeless shelter, assisting people suffering from severe mental illnesses, illnesses far sadder and more debilitating than my mom’s, and I don’t think it’s any great coincidence. I’ve had my own struggles with anxiety and depression, too, whether these are genetically hard-coded, or learned from my mother, or just part of being a writer, I have no idea. But my best guess is that I write (and read) to better understand both other people and myself. As research for this book I read everything I could about agoraphobia, including many first-hand accounts written by people suffering from it. I learned that it’s actually not a fear of the agora (or open spaces), but more a fear of having a panic attack in public, to the point that people avoid going out to escape this possibility. So in a way, it’s like the fear of fear. Which I still find fascinating. I was also astounded by the fact that it’s so little understood, and that it’s vastly more diagnosed in women (which really ought to worry us all, I think), and that its prevalence is steadily increasing. There are so many people out there who are afraid every single day of their lives. It’s heartbreaking. TC: What’s something no one has asked you yet about the book that you wish they would ask? How would you respond? The incredibly gifted writer Wells Tower once republished a new, re-worked version of the same story he wrote for McSweeney’s about two brothers on a hunting retreat, all because he felt that he’d been cruel to one of the brothers, even though the story had already been well received. This is something I admire so much. That almost moral obligation we have to our characters. So are there things I’d change about If I Fall? In retrospect, yes there are. I’ve always been excited by the mash-up of literary and genre fiction (novels like Station Eleven and Fortress of Solitude have done this particularly well), and in my novel I was trying to incorporate elements of adventure fiction (books like Kidnapped and Nancy Drew and Tom Sawyer had always captivated me), but I think I could have alerted the reader to the fact I was doing this, rather than it just potentially reading simply as clichéd writing, which to some people it did. So yeah, that blend between genres could have been smoother, more seamless, more nuanced, but I’m still happy I made the attempt. It remains a novel I’m unreservedly proud of. Also, and most importantly, to me anyway, my mom would’ve loved it.